Meet Reverend Doctor Phil Snider of the Brentwood Christian Church and consider his fire and brimstone speech on including gay, lesbian, bisexual, and transsexual citizens under the protection of Springfield, Missouri’s anti-discrimination ordinance. 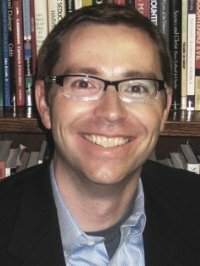 Phil did his undergraduate work at Missouri State University (Springfield, MO), then earned his masters degree at Phillips Theological Seminary (Tulsa, OK) and doctorate at Chicago Theological Seminary (at the University of Chicago). Reading about idiotic religious nuts, who still feel that an almighty is watching over them who wants to dictate if any living species shouldn’t be allowed to love each other? Or the spammers that post their ‘new’ comments on very old topics! Just for everyone’s info, religion lost, as per expected.